English, ca. 1770-1785. This period was also referred to as the Adams period. 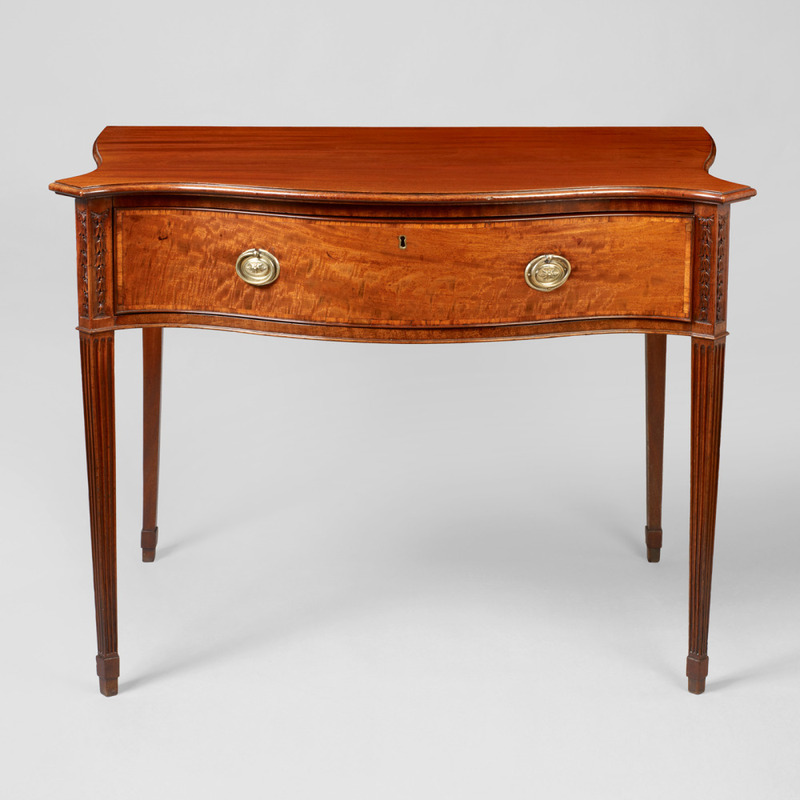 The table is possibly attributed to Robert Adams based on the family history. great-great grandfather Edward Fordham Flower founded Flower & Sons Brewery in Stratford upon Avon in 1831. The success of the brewery enabled his son, Charles, to found and build the Shakespeare Memorial Theatre in 1879, which incorporated an art gallery and library. Under the leadership of my father, the theatre was eventually transformed into the Royal Shakespeare Theatre, a service for which he received his knighthood. Part of a paper label remains glued to the back of this table. It reads that this piece was featured in the "Art Treasures of Warwickshire Exhibition: Royal Leamington Spa Art Gallery: May 29th to July 3rd, 1948. 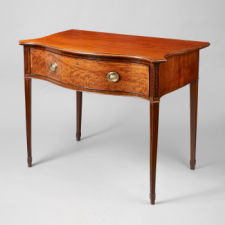 The serving table or side table with a pronounced serpentine front and straight sides has a conforming over-hung top with a bull-nose edge above one long deep drawer with a cross-banded and cockbeaded drawer front fitted with two lidded storage compartments which were probably used for tea. 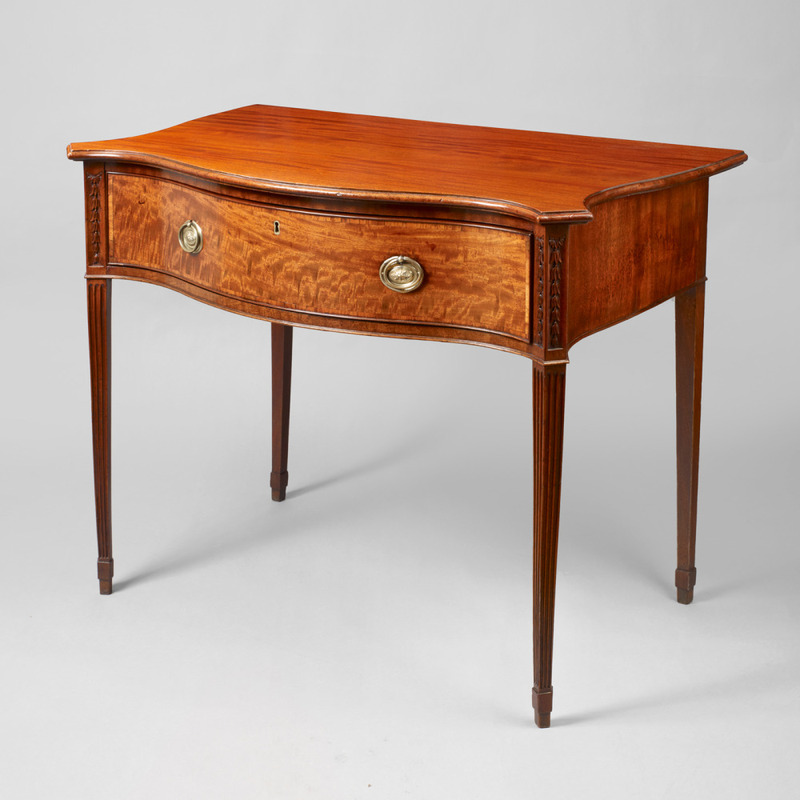 The table is supported by square, fluted tapered legs terminating into a blocked foot. 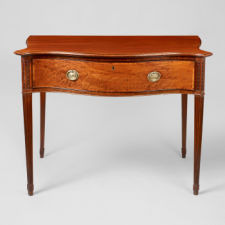 The top portion of the front legs are further embellished with finely carved graduated bellflower-drops which flank the drawer. This rare and possibly unique form is complimented by its well proportioned and balanced dimensions.